Hello readers! I’ve been away from blogging for quite some time, busy with work, project for a friend, acquiring new toys and stuff, and trying to invite a friend to watch movie with me. But my hobby of customizing Indiana Jones figures goes on, and in this blog I showcase a truly awesome custom that I have made. In 1935, Shanghai crimelord Lao Che hired the services of Indiana Jones, to acquire for him the remains of Nurhachi, the first Emperor of the Manchu Dynasty. In exchange, Lao Che offers to Indy a valuable ancient diamond. But when Indy arrives at Lao Che’s nightclub for the exchange, Lao Che had no intention of following through with the deal, intending to keep both artifacts for himself. Shortly after Indy got the diamond, he found himself poisoned after unwittingly helping himself to a poisoned drink, and Lao Che demanded the diamond returned in exchange for the antidode. A fight emerges between Indy and Lao Che’s men, but in the ensuing brawl Indy manages to get the antidode and escape. 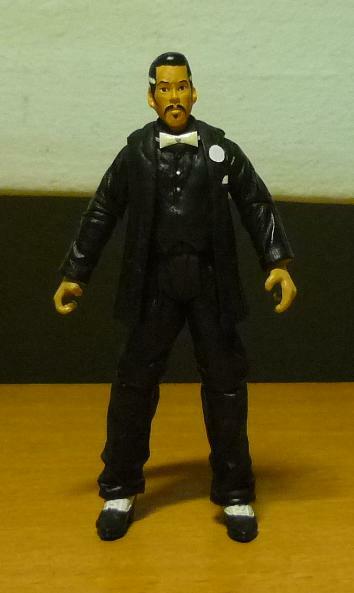 On a poll conducted on the Indiana Jones forum, Lao Che turned out to be the most requested-for custom Indy figure. And it was pointed out that the Tai Huang figure from “Pirates of the Caribbean: At World’s End” bore a uncanny resemblance to Lao Che. So, in order for me to customize Lao Che, I needed to find a Tai Huang head, which was a problem since no one was selling that figure. Then I made an unexpected find at CSC. Some joker had placed a Tai Huang head onto the body of Agen Kolar (from Star Wars), and was selling it, passing it off as another Jedi Knight! I was able to recognise immediately that no such Star Wars figure exists (A Jedi Knight wearing a farmer’s hat? Give me a break!). But anyway, I needed the head, and I found what I was looking for. This figure is a joke, it doesn’t exist !!! The hat was sliced off from Tai Huang’s head, and a pair of Mutt Williams’ ears was transplanted over, with epoxy used to sculpt the hair. A bit of dremeling was done to “shave” off the beard. Painting on the face was limited to only the chin and ears in order to preserve as much original skin colour as possible. As a matter in fact, most of the other work done on Lao Che involved techniques that I had already developed when I did my Tuxedo Indy custom, which includes sclupting the inner vest and jacket, although this time I used a different but much better method to sculpt the bowtie. And finally, the Cobra Commander’s shoes were transplanted to Lao Che, giving Lao Che a pair of swanky shoes befitting the crimelord. Indy meets with Lao Che for the artifact exchange, with Willie Scott, Lao Che’s trophy nightclub singer, having joined the table at Indy’s side. On the table are the funerary urn containing the ashes of Nurhachi (left), and the diamond (right). Note that in the movie, the urn is not THAT big. Lao Che holds up the vial of antidode and swaggers it in Indy’s face. The vial was made from a blue Star Wars lightsaber.